Currently viewing the category: "Idaho Wolves"
News came out last week that taxpayer-funded and woefully misnamed Wildlife Services killed five wild wolves in central Idaho for alleged livestock depredation—another in a long line of such wolf-killing actions by this secretive government agency. The estimated number of wolves in Idaho increased from 684 at the end of 2013 to 770 at the end of 2014. This 2013 figure has been retroactively revised from that presented to the public in April of 2014. 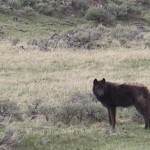 POCATELLO, Idaho – Faced with a legal challenge by conservationists and an imminent hearing before a federal appeals court, the Idaho Department of Fish and Game (“IDFG”) has abandoned its plan to resume a professional wolf-killing program in the Frank Church-River of No Return Wilderness during the coming winter.